Oaxaca is filled with craftsmen tucked away in small corners of the city hammering tinware into picture frames, throbbing Frida-style hearts, and ornate boxes. With hammer in hand, a large nail and metal clippers, they create exquisite designs in locally made metal. The results can be as simple as a small nicho — a little shrine, altar or blessing box. These are usually outfitted with a small glass door, empty inside, waiting to be filled with your own heart’s desire or whatever inspires you. When you are finished, hang it on a wall or put it on a table top. 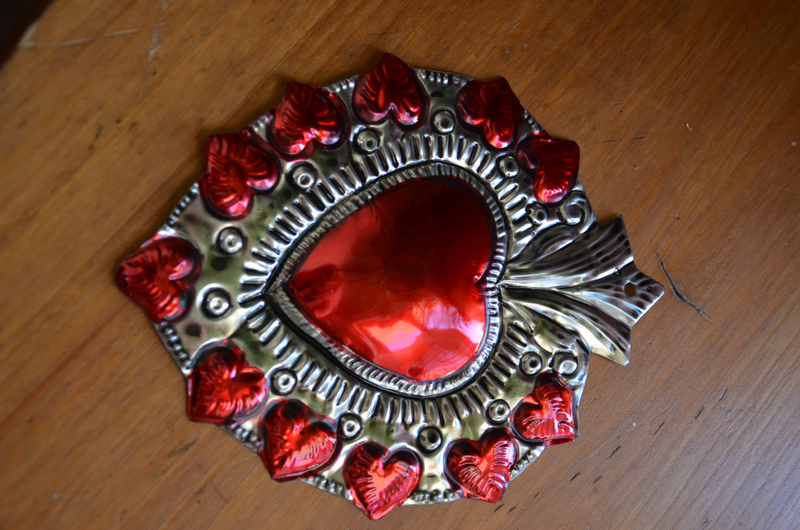 Today, the Artisan Sisters offer you a choice of beautiful tin hearts for sale, painted and ready to hang. Finest quality tinware and painting. An inspiration to visit or return to Oaxaca! Buy the entire collection of 4 REMAINING pieces below for $35 USD, includes shipping to anywhere in the USA. To purchase, send me an email first! Left: SOLD. 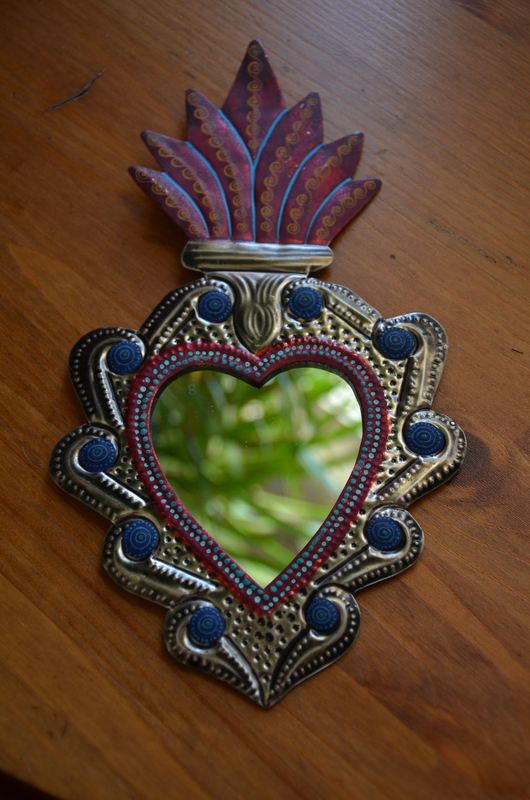 Tin heart with mirror, stunning crown, of red with blue accents, little turquoise dots rim the mirror. See the reflection of the potted plant in the mirror? Measures 9-1/2″ high x 5″ wide. An unusual piece, beautifully crafted! Item #1.08192012. $25 USD. Includes shipping to anywhere in USA. Email me first to order. 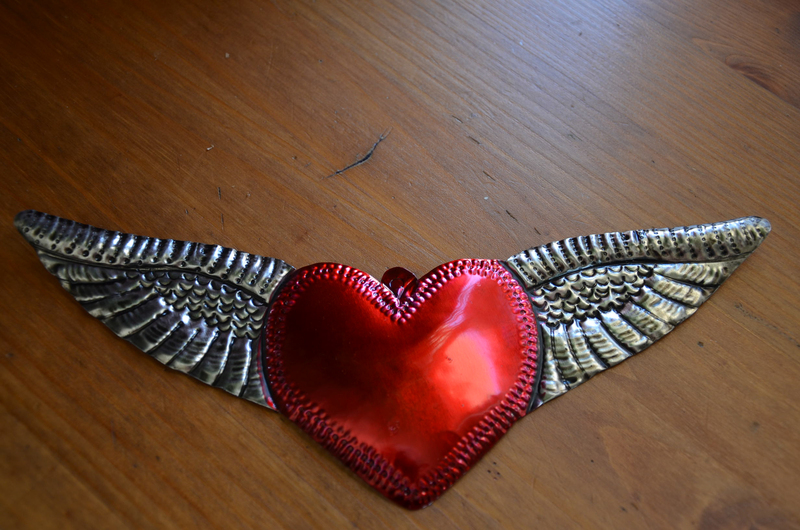 Left: Flying heart — Heart on Wings. Hand-hammered tin and painted. 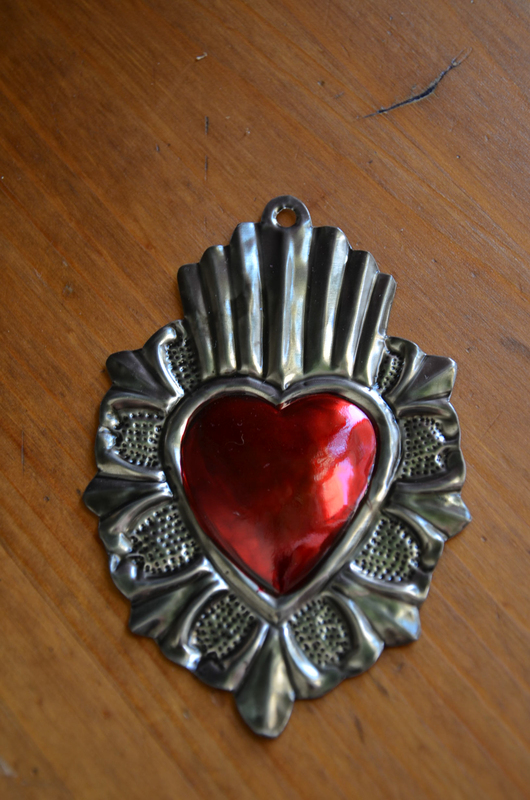 This is the quintessential Frida-style heart that lifts the spirit. Measures approx. Wingspan is 10″wide x 4″ high. Item #2.08192012. $15 USD. Includes shipping to anywhere in USA. Above left: Hearts surrounded by hearts! Measures 7″ high x 5-1/4″ wide. Item #3.08192012. $10.00 USD includes shipping to anywhere in USA. Above right: Feathered crown heart. Measures 5″ high x 3-1/4″ wide. Item #4.08192012. $8.00 USD includes shipping to anywhere in USA. Left: Not a Heart. Circle with center mirror. Measures 3-1/4″ diameter. $10 USD includes shipping to anywhere in USA. Email me first to place your order. 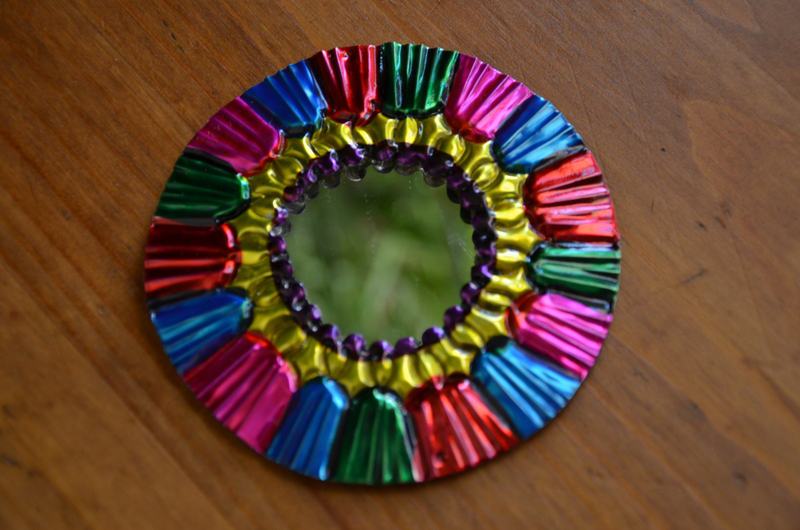 To order your own tin nicho to decorate yourself, contact Chiripa: Artisan Crafts of the Americas. They will give instructions with purchase! And, be sure to visit Nicodemus at the corner of Mina and J.P. Garcia or another artesania at the corner of Reforma and Abasolo for a great selection of tinware when you are in Oaxaca. This entry was posted in Cultural Commentary, Oaxaca Mexico art and culture and tagged blogsherpa, folk art, hearts, Mexico, Oaxaca, tin. Bookmark the permalink. Thanks so much for offering wonderful items to purchase! Robin, the heart mirror is yours! Thank you. Thanks for the mention and the directions for tin artists in Oaxaca. My business partner is in Oaxaca right now! My pleasure. Glad to be helpful.